Mitch McLain was the lone Falcon recognized by the coaches and media in the WCHA Preseason Polls (Photo by Todd Pavlack/BGSUHockey.com). 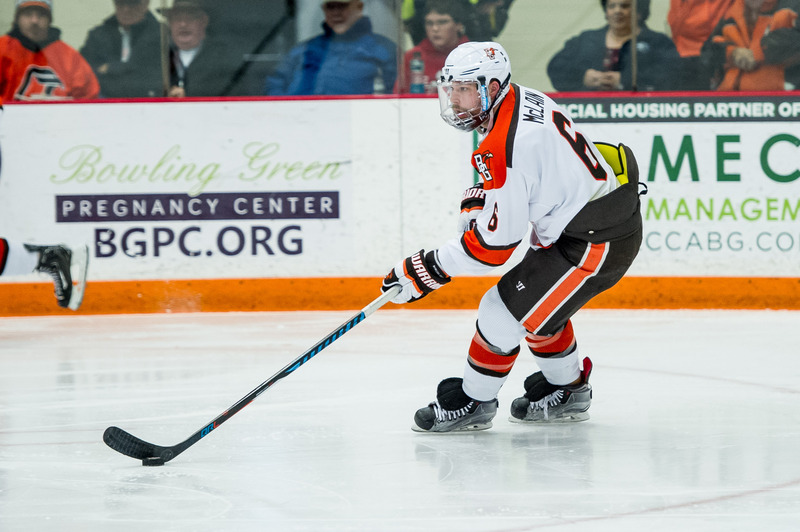 Bowling Green will play the 2017-2018 season out of the “favorite” role, as the WCHA coaches and media picked the Falcons to finish in fourth place during this year’s preseason polls. Last year, the Falcons were picked to finish first in the polls before struggling to a third-place finish. Their season ended as they were downed in double overtime of the WCHA Championship game by Michigan Tech. Here is the breakdown of the coaches’ poll. The number in parentheses next to a team’s name indicates the number of first-place votes that team received. Ten points are awarded for each first-place vote, nine points for each second place vote, etc. Daniel Brickley and March Michaelis, defenseman and forward forward respectively for Minnesota State, were named co-preseason Player of the Year by the coaches. The media selected Brickley only, and Mitch McLain received votes from the media for consideration of the Player of the Year award. Jake Jaremko, forward for Minnesota State, was named by the coaches as the preseason Rookie of the Year. The WCHA was represented by Minnesota State in both the USCHO and USA Today/USA Hockey Magazine preseason poll. The Mavericks were ranked 15th by USA Today/USA Hockey Magazine, and 18th by USCHO.com. Michigan Tech received votes in the USA Today/USA Hockey Magazine poll, while Michigan Tech, Bemidji State, Bowling Green, and Ferris State received votes in the USCHO poll.